Le Moulin de la Tuilerie is a WordPress website for luxury accommodation just outside Paris. Aquaman Design is thrilled to announce being involved with this project. 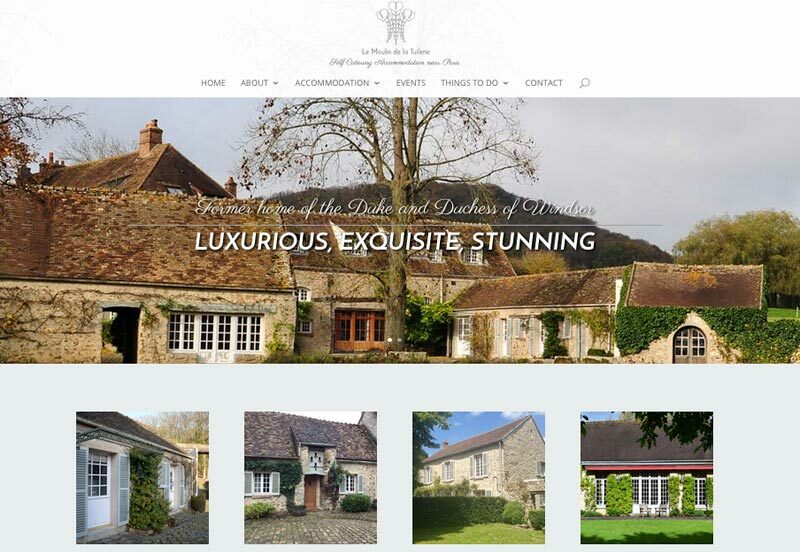 We have designed and created a site to match the splendour of the accommodation, the restored former home of the Duke and Duchess of Windsor. The property itself is owned by the Landmark Trust. The website itself promotes the accommodation at the Le Moulin de la Tuilerie, but also has a growing section of things to do for visitors during a stay, plus a What’s On section which Aquaman Design will be editing each month. This is a good way of adding new content to accommodation sites - this is something Google and other search engines use to rank sites. Aquaman Design is also providing full maintenance support for this site, which includes unlimited updates to the software and extensions that form the backend of this WordPress site. A photographer has been arranged in France to supply images of the accommodation at different times of the year. The website will be managed to reflect these changes in the seasons.